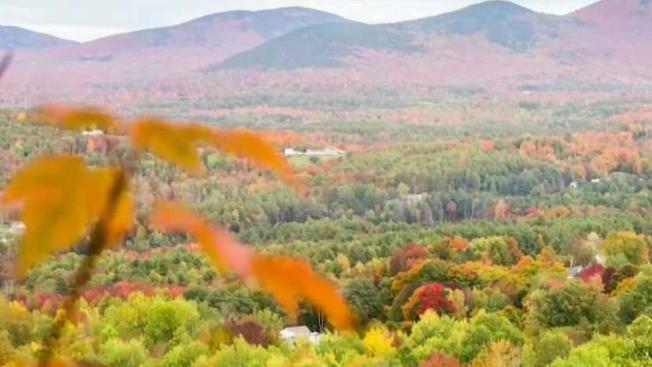 Jack Thurston reports from Waterbury, Vt., where peak foliage season means a tourism boom. Small businesses in Vermont were hoping to cash in on added traffic this Columbus Day—or, as it was proclaimed by Gov. Phil Scott, Indigenous People’s Day. The cars were so constant into the Cold Hollow Cider Mill’s lot that the Waterbury store brought in a sheriff’s deputy for traffic control. Leaf-peepers like Carey are vital to Vermont’s economy. According to numbers from the Vermont Department of Tourism & Marketing, roughly 1.3 million people visit each October, spending about $280 million. The long holiday weekend tops any other weekend for the year for visitor traffic, the tourism department noted. “Saturday was our all-time record day at the mill, until Sunday, which beat Saturday,” Paul Brown, the owner of Cold Hollow Cider Mill told necn & NBC 10 Boston. Brown said he cooked up 15,000 cider donuts Sunday alone to keep up with all his customers. “We do just about half of our revenue for the year in September and October–those two months,” Brown noted. While the autumn colors were slow to arrive this year, they certainly seemed in their full glory in many spots this weekend—especially in northern parts of Vermont and in communities at higher elevations. Because fall foliage travelers enjoy getting off the beaten path and exploring more rural locales, the commissioner of the Vermont Department of Tourism & Marketing said small businesses statewide see a boost. “The fall foliage visitor is more likely to get out into the villages and the towns and smaller communities and experience that sort of authentic kind of way of living in Vermont would be,” Wendy Knight added. Knight predicted fall weekend getaways will pay dividends down the road, too, often inspiring return trips during ski season or the following summer.